Low-latency and media sync are essential requirements to enable interactive multi-party services, such as Social TV. In this work, we present an open-source and customizable framework that allows measuring end-to-end (e2e) video delays and provides support for different types of media sync, including Inter Destination Media Sync (IDMS). This framework can be used by researchers to investigate the suitability of different techniques for optimizing the system performance in terms of e2e delays and media sync. Montagud Climent, M.A, Boronat, F, & Cesar Garcia, P.S. (2014). 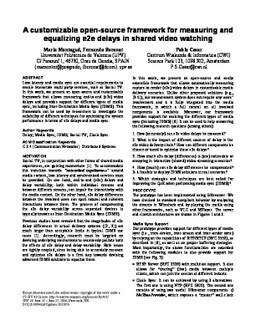 A customizable open-source framework for measuring and equalizing e2e delays in shared video watching. In Adjunct Proceedings of ACM International Conference on Interactive Experiences for Television and Online Video 2014 (ACM TVX 0). TVX2014.